Well here it is the first challenge of 2014 ... hope you all had a really lovely Christmas... and that 2014 will be kind to us. 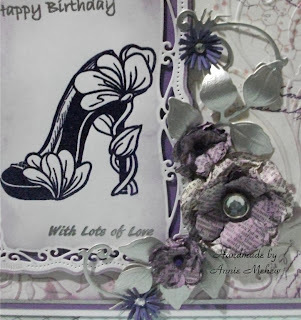 The topper was made by stamping one of Creative Expressions pretty Floral footsteps stamps with Stazon Royal purple then sprinkling with clear embossing powder and heating to glaze it. This was then diecut with a spellbinders die and the sentiments were added. Lorna loves shabby chic frames so I created some shabby chic flowers using pages from a very dilapidated dictionary which was going to be thrown away. Having diecut the various layers I again gently inked them with my distress inks and assembled finishing off with some blingy brads and silver leaves. Oh Annie this is truly ELEGANT!! Just STUNNING!!! Hi Annie! It's always a treat to visit your blog! What a lovely post. Your card is ABSOLUTELY GORGEOUS! I love the embossing and those fabulous flowers! You used, just the right amount of purple! 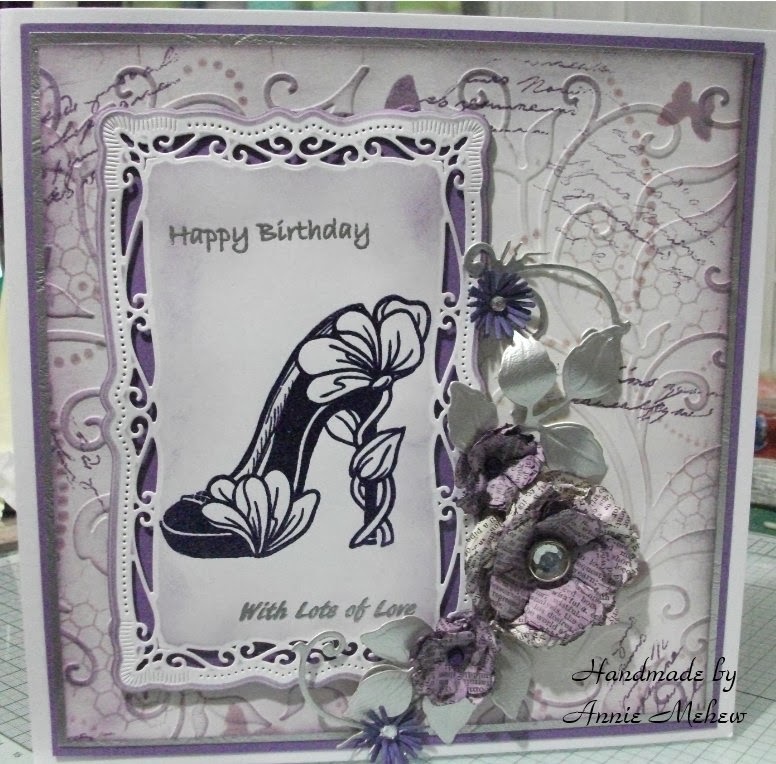 I'm sure that your granddaughter will treasure this beautiful card that you made for her!